Common words but words I never told you." Girls' Generation paid tribute to their caring mothers with the song "Dear Mom" in 2009. This song shares the relationship between a mother and daughter. "I'll become a heart that is warm as the unconditional love you've shown me. I was shy and couldn't often express, that mother, I really love you." g.o.d. wrote this song dedicated to the mother that sacrificed everything to give her son a better life. However, she passed away before her son could admit his love for her. "I loved you even though I never told you once. I love you, please rest now." Jang Woo Hyuk wrote this song dedicated to his mother. 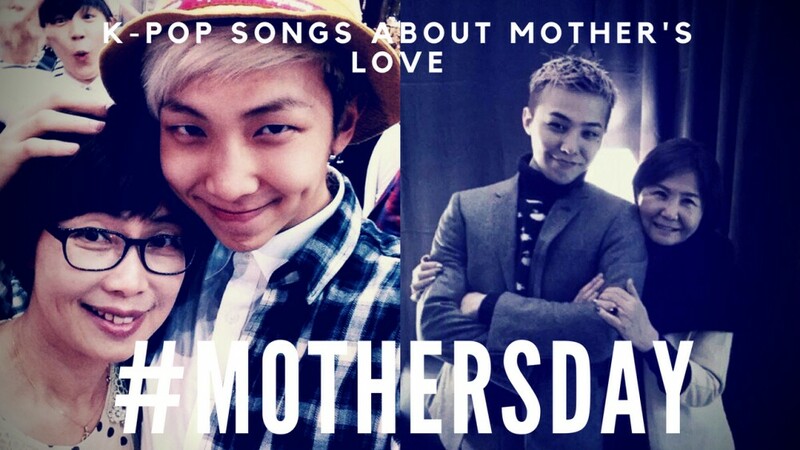 In the song, he appreciates his mother for all that she's done for him and apologizes for being a bad son. "Because she is always in my heart. The most beautiful woman in this world, that person is my mother." This song is dedicated to the struggles J-Hope's mom faced supporting him as he was growing and a promise that now she can lean on him after all the love and support she gave him. Now trust your son, you can smile"
This is a song dedicated to their beautiful and loving mother and the relationship between mother and child. Why are those tears streaming down your face? The music video shares the story between a mother and daughter and their daily routine with each other. we're in this for life yeah"